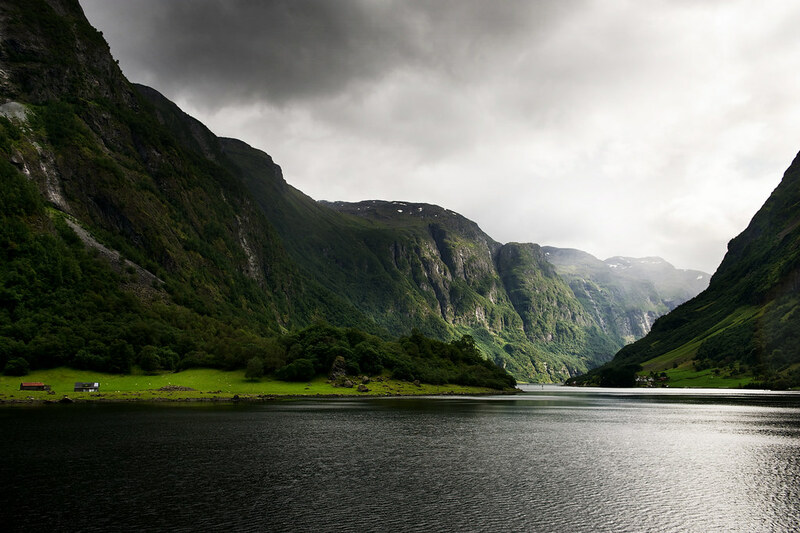 Our local host in the Nærøyfjord, Jan Nielsen, tells us about his vision for his company Nordic ventures and about how tours in the fjords can offer a glimpse into Norway’s rich physical and cultural history. So, how did Nordic Ventures come into existence? Norway is just the perfect place for kayaking. We have a lot of water, we have a lot of lakes, we have a lot of rivers, and the mountains provide protection for the wind. Kayaking is such a peaceful way of travelling, and that really caught me. So we thought we’d open this place to a wider audience. We started offering these trips in 1998 or 1999. I had a partner, and we set up the business together. We had 10 kayaks, and we have grown at a slow and steady pace since then. Today we have 170 kayaks, and we have 35 members of staff. But we still maintain a very high focus on the quality of the trips. And as it’s a UNESCO world heritage site, I understand there are no planes aloud? One of the things that makes Norway special, is that we generally don’t allow motorised vehicles in wilderness areas, without a special permit. That leaves a lot of areas really unspoilt. If you had made your way up a mountain on your ski’s to enjoy a moment, you wouldn’t want a helicopter or a snowmobile to ruin it for you. And Norwegian law provides for that. We have a relaxed approach to the outdoors. That is provided to every citizen by law. This is the ‘All Mans right’, or ‘Allemansratten’. Norwegian Law is beautifully set up to provide access to nature for everyone. This is the same at the sea-shore, and the same in the mountains. It then creates a large responsibility for us as tour operators. There’s a lot of beauty here, that we want to share. But we have to share it responsibly. And what makes these fjords so unique? This area is so unique because the mountains are 50 million years old, and were created by glaciers. So much geographical process is still going on today. The ongoing erosion of the waterfalls, the avalanches and the meltwater are living proof of these forces going on today. That’s the long-term history of the area. But there’s more evidence of the short-term history, in the form of stone-age reindeer hunting and the original agricultural artefacts, not to mention the Norse burial sites. This place is so historically important on two different scales of time, and that’s why it is so rich. A big part of what we need to appreciate today are the things that our ancestors have done for us. The things we take for granted today, such as electricity, heating, internet and easy communication, didn’t exist even a century ago. Life in the fjords has always been about survival, and it is only really in the last 20 years that we can enjoy this place for the pursuit of leisure. So in the same way that we can thank our ancestors for the progression, they have made, do you hope they may be able to thank us for what we have preserved? Hopefully. Hopefully. What makes a trip special is to see a natural beauty, but also to see evidence of what has come before, and the effort our ancestor have made to get us to where we are today. Commuting to work in the Nærøyfjord is a little bit different to commuting to work in London. Once you visit a place like this, you build up a great appreciation for what we have today. If you come away from the experience with this deeper appreciation, you are more likely to walk away with something that was meaningful to you. You are also more likely to understand other places within the same context, and with respect and gratitude for our ancestors. And is a weekend long enough to get this sense of appreciation, do you think? That’s why I think our weekend trips are more interesting. If you come for a day, you may be able to appreciate the beauty of the place, sure. But over a whole weekend, you can start to appreciate how this places fixes us in a historical context. Another thing to understand about Norway in general, is the seasonal variety. We have the brutality of winter, the beauty of spring, the hazy, long, pleasant summers, and then we have a reminder from the man upstairs, that is called autumn. If you don’t have the correct supplies in your house now, you’re going to be in for a hard winter. Life has always been about survival here. If you didn’t have food for animals or wood for your house, you could get very sick and you could die. Our ancestors were tough people. You can explain this on a day tour, but you can’t get people to understand it in the same way. On a weekend trip, we go into the mountains and you can see for yourself that you really are at the mercy of the environment. And so do you think these tours help people to understand the importance of conservation? Definitely. So there are lots of different components to these trips. Firstly, we have a new skill to master, the. kayaking. That in itself is exciting and challenging. Whilst our day tours paddle back in the afternoon, to their respective homes and hotels. But with the overnight trip, we stay out. We get the calmness of the fjord. The ferries stop moving. You may hear a seal swimming up to the campsite, or you may hear an eagle in the early morning, you may even hear an owl at night. You may even have to take a stroll away from the campsite to take a cr*p in the woods, which is also a very special experience. But then the thing that happens is that the campfire conversation always leads somewhere. Those talks often revert back to the environment. Although this year I think we may have a few more conversations about The Donald. This is based on many good talks around the campfire; combining different social backgrounds and cultures is very important, and makes for fertile discussion. I’ve been involved in many conversations that always involve a bonfire, some wine, and perhaps some marshmallows. I’ve met many lifetime friends on these trips, and I know many of our guides have too. Our tours are never better than what our clients put into it. Sometimes you have to think it’s not about what can I get from this trip, it is about what can I offer. And you still get satisfaction from it? For me, one of my favourite moments is when we are very busy, and we see that every trip has gone well, and all of our clients are happy. We have people from so many countries, and they all come to see the fjords. We also have a very low cancellation rate. In 18 years, we’ve had to cancel 8 trips, due to gusts of wind. High morale. Our guides are also often a little bit more weathered than most. We look after our clients very well. Working with people of that calibre is also very motivating. And what do you do to maintain morale? It’s a tricky thing to do. We demand a lot from our guides. But we hire the best industry professionals we can every year. We have had some of the best guides in the world come through our company. I suppose it is the attraction of this world-class destination. There have been some truly remarkable characters come through the company. We’ve had some very funny stories as well. This was years before working with MBA, so you guys were not affected by this. But we had two guides who were going out on a trip. They loaded up all the gear into the van prior to the trip and loaded up all of the gear into the vans. They entered an 11.4 km tunnel. They then remembered they had forgotten the paddles halfway. So they decided to turn the van around into the tunnel and inevitably got jammed up, whilst holding back traffic. We laughed about that one for years to come. We have operated trips involving abseiling, tandem sky dives, glacier walks and kayak trips. In 20 years, we have never injured a client. We are quite proud of this claim. We should probably advertise this more. I guess that’s our job! I see myself working in this industry for at least the next 15 to 20 years. We want to continue to preserve the whilst sharing it with so many people. If we can teach even just a few people the profound principle of ‘leave no trace’, then we will have been successful. In the short term, we do have a few sustainability goals. We are moving away from beef products, we are creating our own reusable bags, and we are totally moving away from using any form of plastic. In fact we have a whole list of sustainability goals for this year, that’s probably too long and boring to tell you about now. Great, thanks Jan. Anyway, I believe you have a tube to catch. It was a pleasure! And yes, can you show me the way? No problem. I’ll guide you this time. Jan provides the following tours from spring through to autumn.